Almost 8 years ago, I went to New Town Bistro to look for a job. Owner Kyle Agha, was the only one out of nearly 20 restaurants I contacted who trusted me to go into his kitchen to do a try-out or a stage (pronounced STAHJ). I ended up not working at New Town, but we've remained friends over the years. Being a private chef, my culinary expertise and creativity is only experienced by a select few: those who hire me, have the fortunate opportunity to attend one of my cooking classes or visit my blog and even then, they only see photos of my food. This restaurant takeover is an opportunity for me to showcase my creativity, my skills and reach a new benchmark in my career. I'm going to push personal boundaries with the menu and hopefully the community will be able to embrace what I'm trying to do. My cooking style is trendy yet inherently Southern with a touch of elegance. I can honestly say that I do not know of a restaurant owner or chef in town who has opened up his or her restaurant to someone else. I think this event will be a Winston-Salem first. 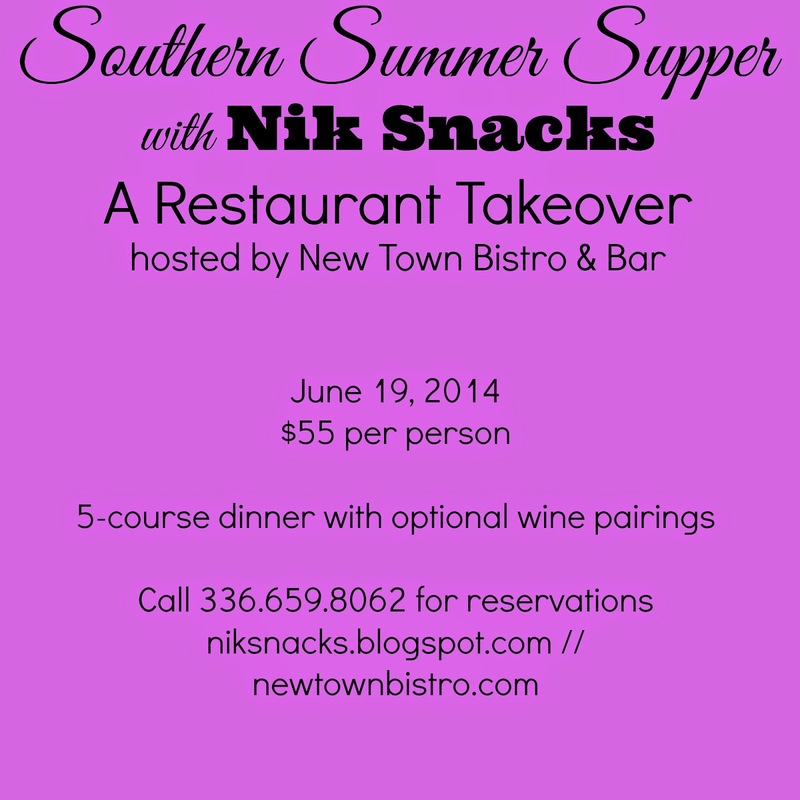 New Town Bistro strives to be cutting edge and offer its customers the best of the best and guess what--this Southern Summer Supper Restaurant Takeover is no different. Call 336.659.8062 to reserve your spot! Sounds like a winning menu!! Yum! I'll take 1 of everything, please! Oh my goodness that menu sounds amazing and that's a bargain of a price for such a fantastic meal! What an amazing line-up! Sounds wonderful! Such a WELL-DESERVED opportunity! The menu looks incredible - but then, this is YOU, so what else would it be?! Ok, that menu sounds out of this world! That menu looks so good! I want to try it all! Yum! what a delicious menu. I want to try everything!! YUM! 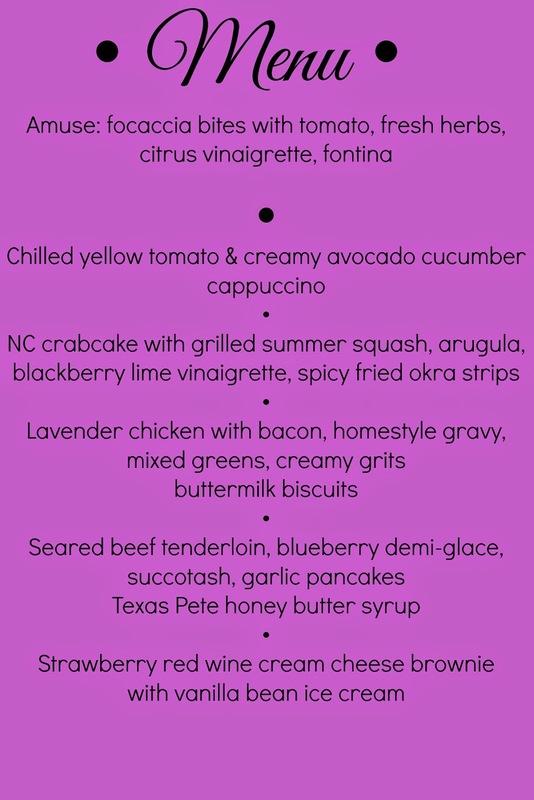 Oh man, this is one of those days that I wished I still lived in Greensboro and could drive up to WS to your dinner. What an incredible menu! What a awesome event you're hosting! The menu looks incredible.